Buy farm fresh Chicken Eggs at market-leading rates from us. We are trusted Supplier and Exporter of Chicken Eggs from Thailand. We also make available Fertile Chicken Eggs and Fresh Chicken Eggs. 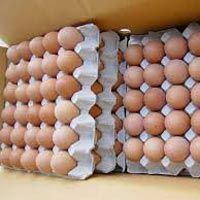 To cater bulk and urgent requirements of buyers, we maintain a large stock of Chicken Eggs. Our Chicken Eggs are known for their high nutritional content, health benefits and freshness. We are equipped with hi-tech processing units where any cracked or unfertilized eggs are removed. The Fresh Chicken Eggs are then packed in sturdy cartons to ensure that they reach the customers on time and in best conditions. We are listed among the prominent Chicken Eggs Exporters and Suppliers in Thailand.